The primary use of the best vacuum sealers is for food storage. Whether you want to freeze fresh produce so you’ve got a nice stash or portion up leftovers, vacuum sealing is a smart way to extend the life of food without compromising quality. You can also use a vacuum sealer to prolong the lifespan of dried foods so they are versatile pieces of kit. In today’s Weston Professional Advantage vacuum sealer review, we’ll explore this top-notch model from an industry heavyweight. For homeowners with a more fluid budget or anyone with a catering establishment looking for quality above all, this is a strong contender for the best food sealer in its class. If you place quality above the bottom line but you still have a keen eye for a bargain, the Professional Advantage vacuum sealer is a real win-win. You get all the brand heritage and attention that detail associated with Weston but at a price you’ll love. Weston has been in business for over 20 years specializing in home food processing. Based in the US, Weston vacuum sealers are targeted at commercial users or homeowners with a discerning eye. The Professional Advantage is one of their entry-level vacuum sealers. While it’s marketed as a commercial-grade unit, the smaller motor means it takes a bit longer than the more upscale Weston sealers to get the job done. This means it might not be the best bet if you have a restaurant and time is of the essence. Off the bat, be aware that the 210-watt motor is considerably smaller than you’ll find on the Weston Pro-1100 (680-watt) or the Pro 2300 (935-watt). Make no mistake, this little powerplant is still more than fit for purpose. If you’re looking for a really quickfire sealer, though, it’s worth investing in one of the more expensive models. On the plus side, the fan-cooled motor is expressly designed to prevent overheating even under heavy use. The power is also sufficient for consistent and accurate sealing results. Using the Weston couldn’t be easier. There’s nothing worse than a kitchen appliance with a control panel like a plane cockpit. 6 simple buttons give you all the functionality you need and nothing you don’t. With Automatic mode, just fire up the sealer, press Start and it will take care of business for you. Manual mode affords you a bit more flexibility. The Pulse feature is great if you want to sidestep crushing any soft food. 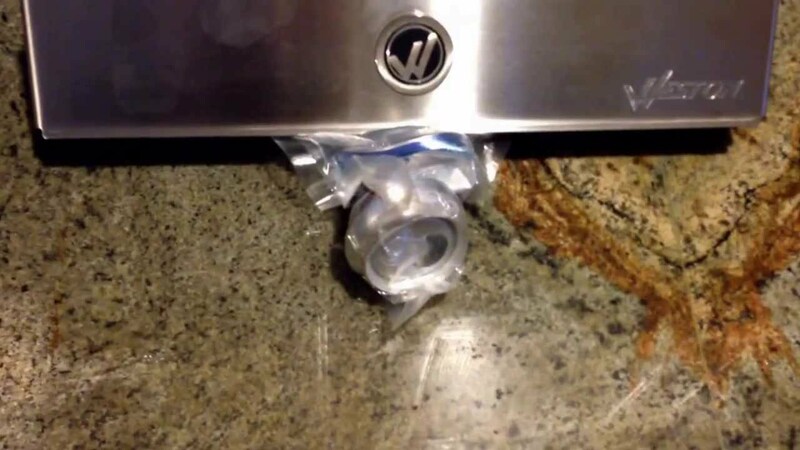 It also helps to stop unwanted moisture being sucked in. Simply hit Seal when you’re ready to roll. We’d recommend Manual mode for any kind of food that’s susceptible to damage. The effort required on your part is minimal and you won’t end up spoiling the food you’re trying to save. There’s a progress bar with LED lights to show you how the sealing is coming along. There’s also a nifty hose accessory port. This allows you to seal vacuum canisters without taxing the main chamber. For anyone looking to seal jars or any other containers, this is a superb touch. Both the hose and canisters are available separately. This port also lets you take advantage of 2 marinating modes extending you even more freedom to whip up some delicious treats. One of the key issues with many vacuum sealers is the way liquid ends up being forced back into the unit clogging things up and potentially even causing it to break down completely. Weston chose to angle the chamber openings stopping this backflow of liquid. 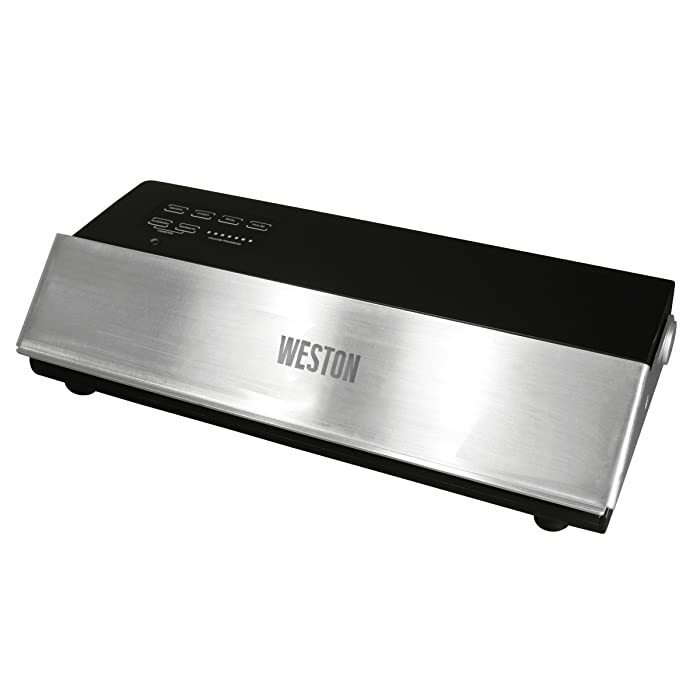 The Weston is an out-of-chamber sealer. This means you’d be strongly advised to use bags with textured or embossed linings. It’s not worth pushing your luck here and trying to press regular household bags into commission. The last thing you want is the innards of your new purchase snarled up with something not intended to be used. You’ll get 15 bags thrown in so you can get up and running straight out the box. Good for bags up to 11 inches wide, you’ll be able to store and freeze even larger cuts of meat with ease. The Weston doesn’t just get the job done but it looks the part on your kitchen counter, too. Matte black plastic contrasts wonderfully with the stainless steel lid. While it’s heavier than cheaper vacuum sealers, the Weston is a perfect combination of style and durability and it’s still relatively compact at 8 pounds. This vacuum sealer measures up at just 18 x 10 x 6 inches so it won’t eat up too much precious real estate on your countertops. For anyone with one eye on certification, the Professional Advantage comes with the full backing of ETL for your complete peace of mind. As crowning glory, you’ll get a 1-year limited warranty from the manufacturer. Take note that this is reliant on your completing and returning the warranty card in the first 30 days after purchase. Don’t overlook this and risk invalidating your guarantee. If you want the enduring build quality and first-class components that come with buying a Weston and you don’t really need the raw pace the pricier Pro models provide, we can’t recommend the Professional Advantage highly enough. No product is perfect, though. There’s nothing worse than reading product reviews where flaws are never mentioned. To this end, once we’ve showcased the benefits of this handy little vacuum sealer, we’ll also draw your attention to its weaknesses. That way, you can make an informed choice and decide if this is the best solution to your food storage needs. The good news is that using the Weston vacuum sealer is an absolute breeze. In this mode, you need to do nothing except wait for the machine to seal the bag and you’re done. To the right of the buttons, there are 7 LED lights that indicate Vacuum Progress. Vacuum sealing really doesn’t get any easier! There are a number of situations in which you might want a bit more latitude. It’s here that the Manual mode comes fully to the fore. Often, you’ll want to vacuum seal foods that are a little more fragile and need handling with care. The last thing you want is to crush up softer foods spoiling your presentation when it comes time to serve them up. There are 2 buttons at the bottom marked Accessory and Marinate. Simply plug in the hose to the port. As you’ll see from the pretty balanced advantages and drawbacks, we never hold back when it comes to flagging the weak points of a product. We’re here to help you make an intelligent, informed decision. We’re not here for a quick sale. 1) Where is the Weston Professional Advantage made? While the company itself is based in Ohio in the US, the products are made in China. Don’t let this put you off since many millions of American products are assembled in China. Quality varies but that’s all about the product and little to do with where it’s made. 2) Why is a Weston vacuum sealer more expensive than a FoodSaver? Setting aside brand heritage, the internal parts are more robust. The housing are also a little more rugged. The fan-cooled motor also allows you to use your Weston for extended periods without any risk of overheating. Beyond this, FoodSaver offer no replacement parts or servicing so could almost be considered disposable where Weston vacuum sealers are certainly not throw-away. 3) Is the Professional Advantage a commercial-grade vacuum sealer? In a word, no. As with any marketing message, you need to take claims with a pinch of salt. We’re not suggesting the Weston Professional Advantage is not extremely well made or incapable of being given some pretty heavy punishment. Where this model falls down is due to a motor too small to allow for really quickfire sealing. If you have a coffee shop or restaurant where time is money, think about buying the Weston Pro-1100 or Pro-2300 instead. 4) What’s the maximum bag width for sealing? You can seal textured bags up to 11 inches wide with this model. 5) Can you use non-textured bags in an emergency? It’s wiser not to. The bags are not expensive so it pays to keep a decent stockpile avoiding the temptation to use the wrong type of bag which might easily damage your vacuum sealer. 6) Is it essential to use Weston bags? Absolutely not. As long as you make sure they are textured, you can use any brand of bags as long as it’s designed for an edge vacuum sealer. This widens your options and lets you shop around for the best price. 7) Do cheap, generic bags work well? We’ll be honest, they don’t. Many of these bags don’t seal properly. If you factor in the wasted bags, they might not end up such a cheap proposition after all. Buy cheap, buy twice! 8) Is the housing durable enough? Yes. This is where low-quality vacuum sealers fall down. The Weston Professional Advantage packs stainless steel housing. This might add a little weight but it’s well worth those extra pounds for the increased durability. 9) What is sous-vide cooking and why do I keep seeing this term in vacuum sealer reviews? Sous vide is French for under vacuum. 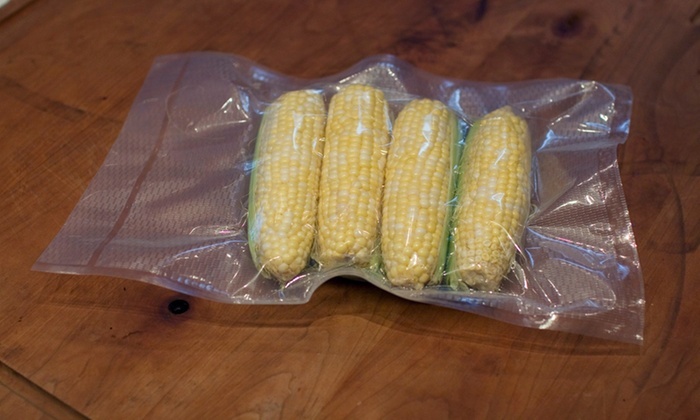 This technique involves vacuum sealing food in bags then using a water bath to cook it to an extremely precise temperature. 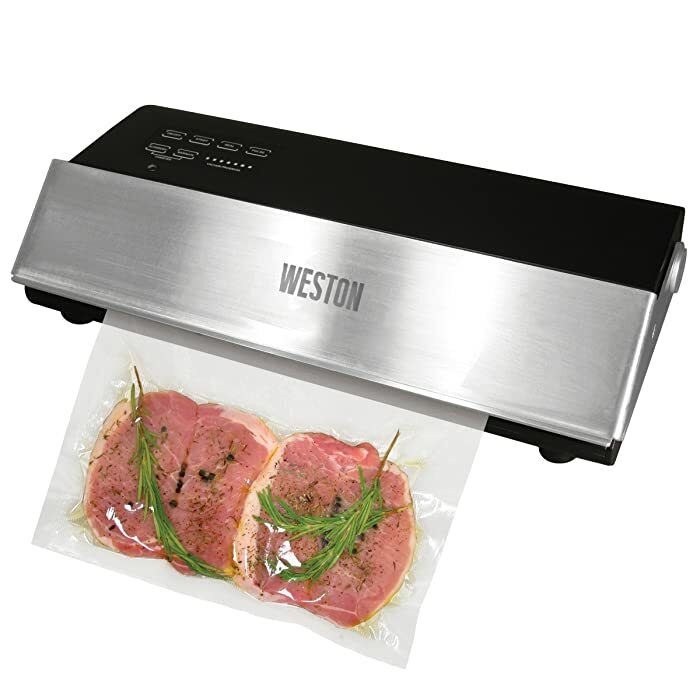 Weston vacuum sealers are ideal if you want to take this impressive method of cooking into the home kitchen. 10) Can you seal wet foods with the Weston? Vacuum sealers come in handy for more than just storing food for freezing. Marinating meat and fish is an additional benefit that the Weston gives you. If you’re busy but don’t want to sacrifice the quality of your meals, leave a choice cut with the sauce seeping into all day and fire it straight into the pan when you get back home from work. Are you a coffee lover? If so, keeping your favorite ground coffee even fresher for longer is a cinch with a vacuum sealer. If you enjoy racking up a supersized pot of soup but can’t get through it all in a single sitting, pop some into vacuum-sealed bags and enjoy it throughout the week. 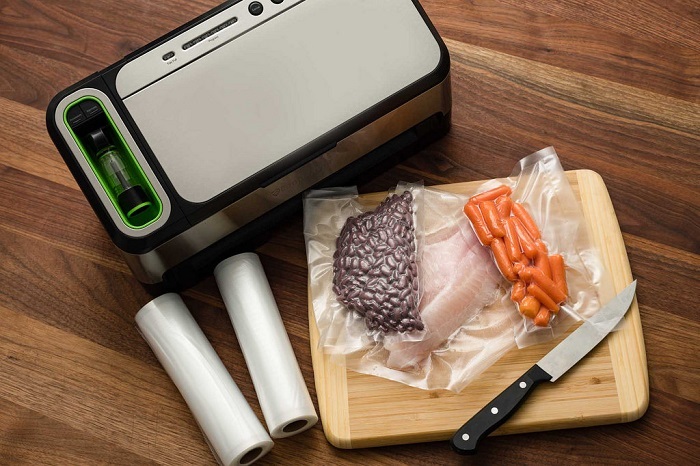 We could go on and on with the uses of a vacuum sealer but we’re sure you get the message… They’re incredibly versatile additions to any kitchen and well worth the modest investment. If you’re looking for one of the best vacuum sealers for home use from a brand you can trust, we’d highly recommend you check out the Weston Professional Advantage. This great little appliance offers affordability and even the potential to save money by avoiding waste in an ultra-compact unit that should last for years if properly maintained. What are you waiting for? Road-test one today and start sealing tomorrow!